Pesticide storage must be maintained and fully compliant. Make sure your storage building is leak-proof and has a secondary containment sump. 2. Keep your pesticide storage in its original containers and never store pesticides near food, animal feed, or medical supplies. 3. Do not stockpile pesticides. Reduce the storage of your pesticides with buying only what is necessary. 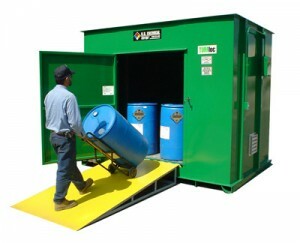 A pesticide storage building should be slightly larger than the amount of pesticide storage on-hand. 4. A secure pesticide storage building should be used to avoid any tampering, and/or vandalism. Safety locks on the doors are can prevent unauthorized entrants. 5. Pesticides should be stored where flooding is not possible. Higher ground elevation should be utilized for the compliant storage building. 6. Identification of the pesticide inventory is necessary. 7. Following all of the storage instructions on the original pesticide label will increase the safety of the pesticide storage. U.S. Chemical Storage offers fully compliant pesticide storage buildings in order to keep your investments safe and secure. Providing you with the safest and most reliable storage buildings on the market. Our storage buildings are 100% customizable and designed to house small or large quantities of pesticide storage while keeping them maintained in the storage process. Our storage buildings are constructed from heavy-duty steel metal to provide a very strong steel frame. Our storage buildings feature a leak-proof, secondary containment sump in the case of a pesticide spill or leak. Keep your pesticide storage safe and maintained with our wide variety of customizable parts and accessories. Accessories such as mechanical ventilation, spill detection sensors, alarms, lighting, and shelving provide a compliant storage building for all of your pesticide storage needs. Keep your pesticides fully compliant and maintained with a pesticide storage building from U.S. Chemical Storage.